New paintings and drawings, photos and more. My wide experience with a variety of horse breeds has allowed me to draw on a detailed knowledge of the horse in all its beauty of form and motion, and I feel my drawings and paintings reflect that experience. Growing up on a dairy farm in southwest Wisconsin also allowed me to observe wildlife in nature and the love of animals is expressed in my drawings and paintings. My husband, Ray, and I also raised cougars for a time and that has provided an insight into the world of big cats and how they look and behave from birth through adulthood. I work in pencil and acrylics. Currently working on a pencil of a bighorn ram, called "Posturing." He is posing to show how big and tough he is. This is just a beginning, but I think it is working, so far. 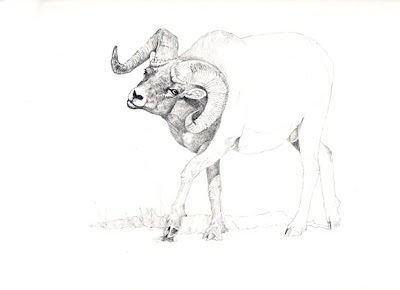 It's on Fabriano hot press w/c paper, 9 x 12, and will probably mat to 8 x 10 or so. 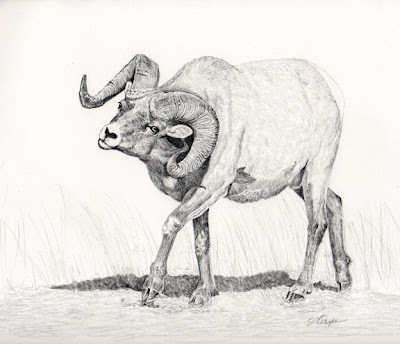 For me, pencil work is very intense, but I love to do it, total control, lol. Any comments welcome, and thank you. 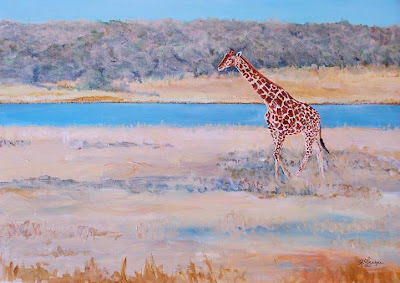 This is a new 11 x 14 acrylic of a single giraffe. I have several pieces in progress, and more will be coming. Some health issues have slowed (read stopped) any new posts for a while. 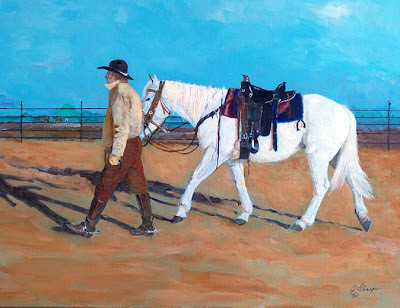 Here is an acrylic piece, 11 x 14, called "Long Shadows" of an old cowboy and his horse, at the end of the day. This piece is for sale, nicely framed. Contact me for details. I've been working on several paintings lately, and this is the latest completed piece. 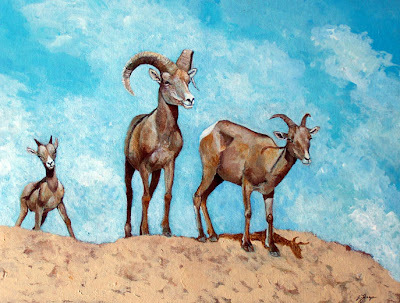 It's 12x16 acrylic on a canvas panel, from photos I shot years ago. 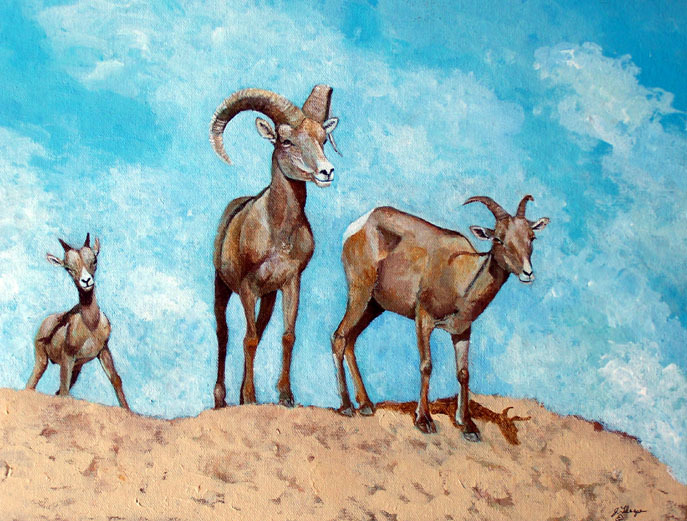 This was a fun piece, just playing with the paint, and having fun with the sheep. The youngster dashing up to the top was a hoot! Both adults ignored him, though. Sometimes life just gets in the way so we can't do the things we really would like, and we have to put some things on hold. That's been my situation for a time, but I've been painting in between all the other things. And so I want to share a new painting just finished. This is an 11 x 14 acrylic on a panel, from reference generously shared by John Wagner of Colorado. 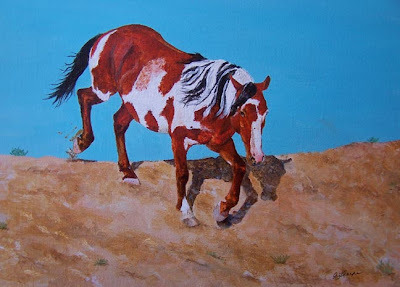 The horse is the wonderful PICASSO, of the Sand Wash Basin wild horses. He is about 23 years old, and just epitomizes the wild horse to me. 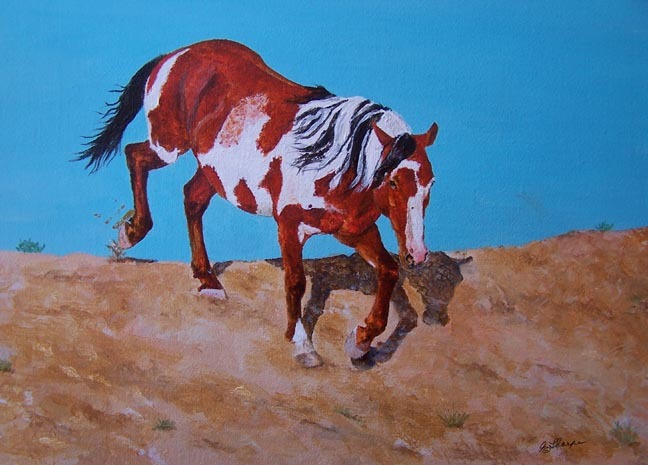 I'm sure there will be more paintings of Picasso as well as other mustangs from that area. Anyway, here is "On The Move" and I hope you like it. I have been so busy, and haven't taken time to post here. So much going on right now. Yesterday I spent time looking through photos I shot at Helldorado Days in Tombstone, and printed several good ones for paintings. More on that to come. 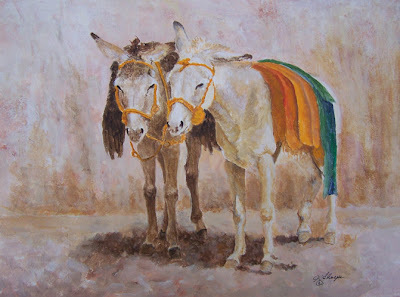 This is a 9x12 acrylic in progress of a pair of patient burros, kind of snoozing in the afternoon. It's almost there, but I have some tweaks yet. This is actually the third go from the reference. First was in watercolor, didn't like it; then in colored pencil, didn't like it . . . so now acrylic, and so far so good, I think. I always want to hear comments on any work I post! It's revealing to see how others view the painting or drawing; sometimes uplifting and sometimes not, but always welcome.